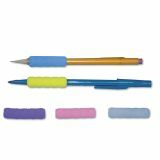 Tatco Ribbed Pencil Cushions, 1-3/4", Assorted, 50/Set - Soft foam cushions offer a comfortable writing grip and reduce writing fatigue. Ribbed surface enables better gripping. 1-3/4" long.